An exhition featuring sculptures and paintings by local and foreign artists opened at Vietnam Fine Arts Museum in Hanoi. 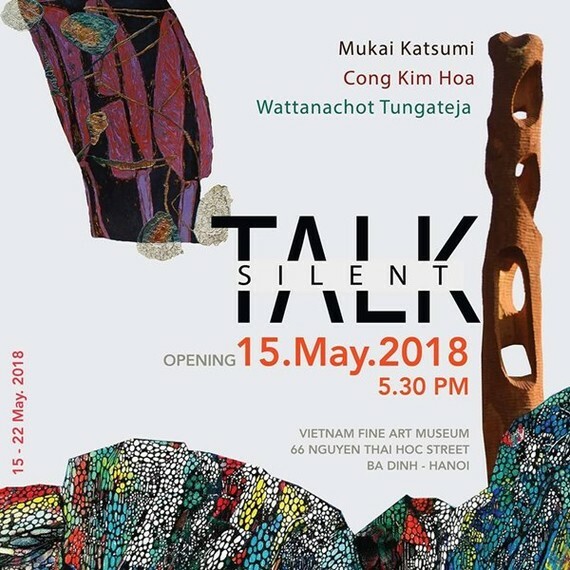 The event themed “Silent Talk” presents the expression languages and the use of materials by artists Wattanachot Tungateja of Thailand, Japanese sculptor Mukai Katsumi and Vietnamese artist Cong Kim Hoa. Wattanachot Tungateja uses the modern medium of acrylic paint. The shapes in his paintings seem simple at first glance with fields of rocks, the sky, but when they are looked closely, they turn out to be abstract images of the world and humanity. Cong Kim Hoa’s artworks are Vietnamese traditional lacquer paintings. Her abstract works are constituted by bold shades and brushstrokes, and he successfully uses the color lacing technique of lacquer art. In her paintings, sometimes shapes and strokes are just a tool to emphasize a deep, rich background. Mukai Katsumi is a familiar name with Vietnamese art lovers. He has visited Vietnam many times. Several his works have been displayed in art centers in Vietnam. His scultupres in “Silent Talk” are made of wood, presenting the invisible links between human and nature. The display will run until May 22.